Reports were out that Renault India is making plans on launching its 4×4 flagship version compact SUV Duster in India. 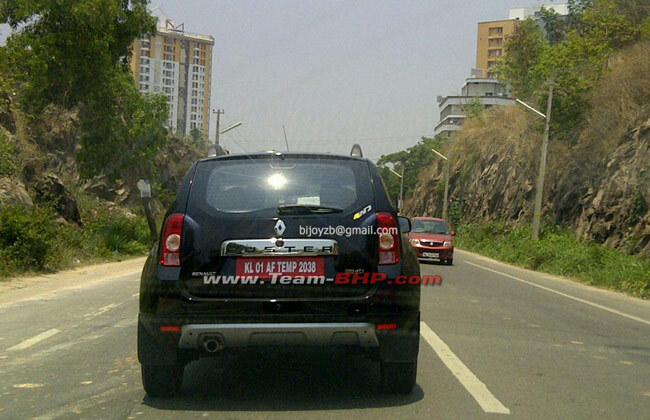 The car was seen being given a test drive by the BHP- team in Kerala. A sticker on the back depicts possibility of the vehicle being made of is all deposits possibility of the Vehicle being a four-wheel-drive. The Four-wheel-drive (FWD) is already an available option in the world, but is not in India cause of its high price tag. Now Ford ready to launch its Concept SUV Ford EcoSport, which is already competing neck to neck with the Duster in several of the markets, which has made it even more important for Renault to launch some more variants in order to keep doing well. Developing the 4WD Duster in its Chennai plant, from where it will be exported to the UK market, makes it easy for the company to launch a similar version here in India as well. At the moment it is early to verify on the success of 4WD variants, if priced well, should attract the off-road lovers and the ones going to pay excess amount for a 4WD SUV. Expectation is the 4×4 car will retain the 1.5 diesel engine churning out 108 bhp and 148 Nm of torque. Renault Duster is not only complimented for bringing back good days for the French auto maker in India but it also got the culture of compact SUV in the country. Launched in July 2012, the Duster is the top-selling car of the country, making other automakers also to try the launch in this segment. Like wise Mahindra’s first compact Quantas Compact SUV was launched in October, Next in league is the most anticipated Ford EcoSport. Considered to be the closest rival for the Duster, a fierce battle amongst the two is expected, as per the guidelines of two super impressive vehicles of the new era.